Grease a 9 x 5 inch loaf pan. Preheat oven to 350°F. In a medium bowl, mix together the flour, salt, baking powder, nutmeg and Matcha tea powder. In a large bowl, beat together butter and 1-1/2 cup of sugar until light and fluffy, about 3 to 5 minutes. Add the yolks into the butter mixture, one at a time, mixing well in between each addition. Add the vanilla and the lemon zest. Add dry ingredients into the butter mixture. Do not over mix. Meanwhile, in a large bowl, beat the egg whites until soft peaks form. Gently fold the beaten egg whites into the cake batter. 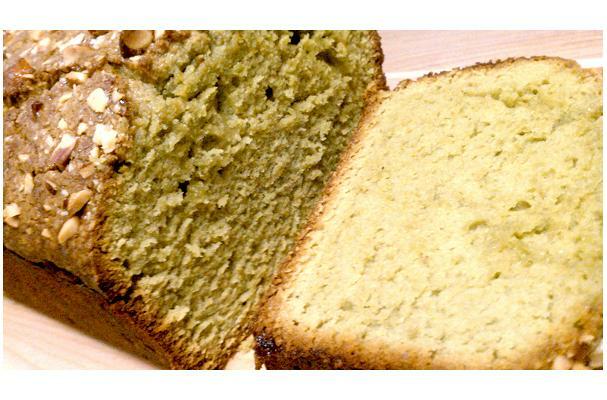 Pour the batter into the loaf pan and garnish with pistachios or almonds. Bake for one and quarter hour, or until a fork or a toothpick comes out clean. Meanwhile, over medium heat, mix 1/4 cup of sugar plus the lemon juice in a small saucepan until the sugar dissolves. Set lemon glaze aside to cool. When the cake is done cooking, let cool on a wire rack for five minutes before removing from loaf pan. Pierce the top of the cake with a fork. Set the cake on a wire rack over a cookie sheet. After the cake has been removed from the pan, drizzle lemon glaze over the cake. The cookie sheet will neatly catch the glaze to make clean-up easier. Enjoy your first slice when the cake is completely cool. Note: Recipe adapted from a Pound Cake recipe in Mark Bittman’s, "How to Cook Everything".